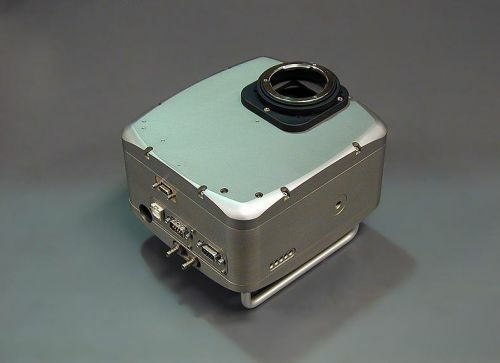 The Research Series Self-Guiding CCD cameras from SBIG represent a new step forward in the field of astronomical imaging. These cooled, large format cameras leave nothing to be desired in the way of features and functionality. 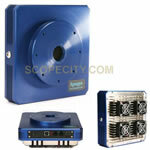 The Research Series cameras support a variety of imaging sensors. 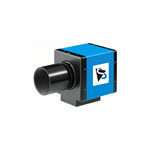 The STL-6303E with full frame CCDs offer high quantum efficiency and greater dynamic range. 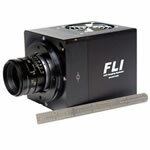 These cameras are excellent choices for wide field imaging with short focal length scopes. 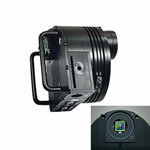 The built-in guiding CCD is a TC-237H frame transfer device with high sensitivity and a 657x495 pixel array. 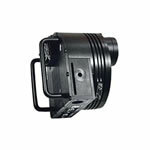 The built-in filter carousel accepts both 50mm unmounted round filters and filters mounted in 48mm threaded cells. Filter selection is accomplished with the camera control software. The front cover of the camera is easily removed for changing filters. Since the CCD is in a separate sealed chamber, removal of the front cover to change filters does not expose the CCD to dust or air and the desiccant does not need to be recharged after replacing the cover. A shutter mechanism is also located inside the camera body, between the filter wheel and the sealed CCD chamber. An internal 12VDC regulated power supply is added to the camera for simplified power requirements and greater tolerance of input voltage variation. When operating in the field from a 12V battery, current drain, power cord extensions and cold temperatures may cause the input voltage to drop below 12 volts. The internal regulated supply will accommodate some variation in input voltage (from about 10 volts to 18 volts) and keep the camera operating normally. This will allow for longer power cords to be used with less concern for voltage drops so long as the input voltage stays within a certain range. A set of indicator LEDs will let you know if your input voltage at the camera is getting too low for normal operation. A universal 90-240VAC, 50-60 Hz power supply is also included for operation from virtually any line voltage in the world. The standard cooling design utilizes a very efficient two-stage TE cooler for maximum performance with large format detectors. 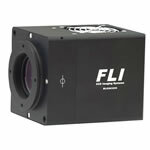 Each camera is also liquid assist ready so that additional cooling in warm climates may be achieved by circulating water if needed. A special magnetic levitating fan is being tested to eliminate even the smallest vibration. Cooling to -50 Degrees C below ambient can be achieved with this system. Custom waterproof, dustproof, crushproof Pelican carrying and storage case. 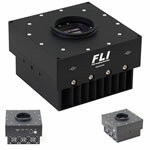 FLI ProLine CCD Camera, E2V CCD230-42-1-144 Front ILLUM. 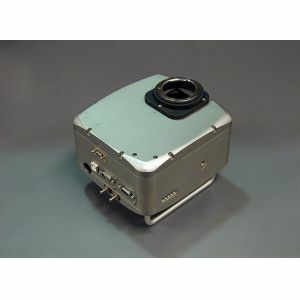 Imaging Source DMK 51AU02.AS Monochrome CCD Camera, 1/1.8"